After some debate with collectors and other dealers I determined that we would not separately list the two versions of SBP2 (although some dealers and the Modern British Philatelic Circle are trying to). 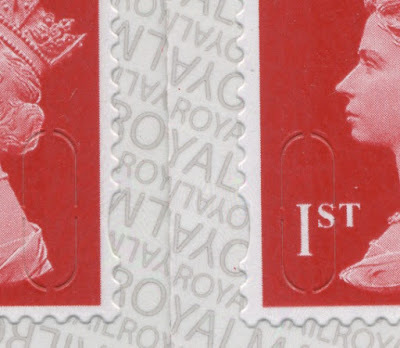 I concluded that most collectors would want only one type (indeed, some want only one stamp whatever the backing paper looks like), and that it would be too easy to make mistakes. Not only that but holding stocks of both would be expensive. So we sell what we have only distinguishing between plain, SBP1 and SBP2. 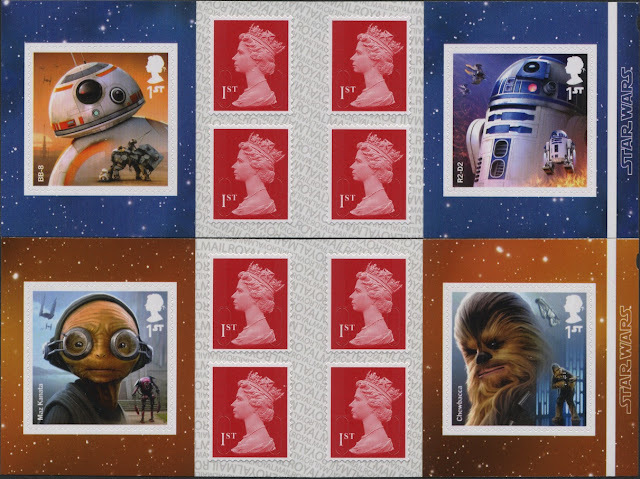 However, that doesn't mean that we ignore the matter entirely, and the new Star Wars retail booklets to be issued on 12 October provide a good opportunity to show the difference, because in our supplies, the two booklets are printed on differently presented backing paper! The booklet with blue selvedge includes the BB-8 and R2-D2 stamps; the booklet with the brown selvedge includes the Maz Kanata and Chewbacca stamps. The blue booklet (on the right) has Small and Large Upright, followed by Small and Large Inverted text. The brown booklet (on the left) has Small Inverted, Large and Small Upright, and Large Inverted. As far as I know all the booklets are printed in the same orientation, that is upright (unlike much older stitched booklets which were printed tete-beche). So all should be the same - at least from the same roll of paper. However, it is more than possible that one or both booklets were printed from more than one roll of paper, and therefore they could both exist with the backing paper in both orientations. I look forward to seeing reports of booklets bought from Post Offices or delivered from Tallents House, if they are different to these.